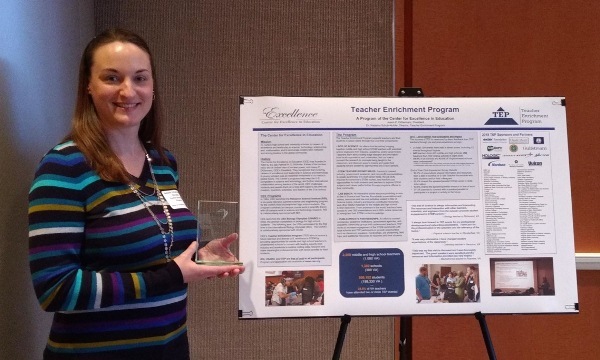 McLean, VA – January 16, 2019 – The Center for Excellence in Education (CEE)’s Teacher Enrichment Program (TEP) was one of 12 recipients to receive an award from the Virginia Mathematics and Science Coalition’s (VMSC) 2019 Programs That Work. The award was presented at the VMSC Conference and Recognition Ceremony held in Richmond on Tuesday, January 15th. The mission of the Teacher Enrichment Program is to assure a future talented and diverse U.S. workforce in science, technology, engineering and mathematics (STEM). TEP provides opportunities for underserved rural and urban middle and high school teachers to connect with experts from industry and academia to explore cutting-edge research and development and make meaningful professional links with direct benefits for their students. To date, over 2,850 teachers from 1,300 schools have participated in TEP, impacting over an estimated 500,000 students. The Center for Excellence in Education was founded in 1983 by the late Admiral H.G. Rickover and Joann P. DiGennaro, President of the Center. The Center's mission is to nurture high school and university scholars to careers of excellence and leadership in science, technology, engineering and mathematics (STEM), and to encourage collaboration between and among leaders in the global community. CEE sponsors the Research Science Institute (RSI), the USA Biology Olympiad (USABO), and the Teacher Enrichment Program (TEP). For more information about the Center and its programs, visit www.cee.org. The Virginia Mathematics & Science Coalition is a private, nonprofit 501(c)(3) organization dedicated to achieving excellence in mathematics and science education for Virginia’s K-12 and higher education students. Their mission is to bring together education, scientific, corporate and public policy leaders committed to the sustained elevation of mathematics and science education to ensure that all Virginia’s students and citizens have the foundation required for life-long success in their daily lives, career, and society. For more information about the VMSC, visit www.vamsc.org. Natasha Schuh-Nuhfer, Ph.D. accepted the CEE award for the TEP Program.